Decision making seems like a straightforward process of conscious mental functions. We view making decisions as an application of conscious mental process such as cost and benefit analysis, likes and dislikes, value systems and personal preferences related to those values. Yet, decision making involves a whole other part that is mostly subconscious. That’s what makes it tricky! The subconscious part of decision making calls for an awareness leading to insight about those fleeting ideas of subconscious processes like gut feelings, biases, the effect of context and the meanings we make of the choices as the result of the way they are presented to us. 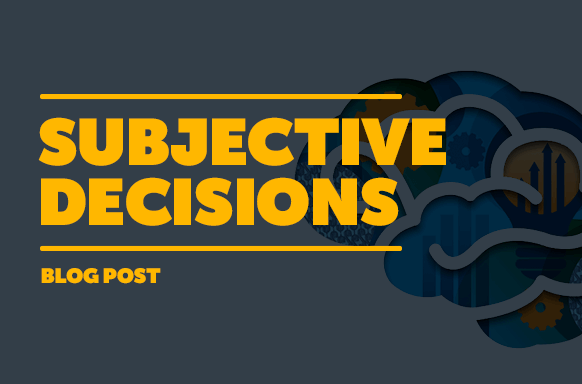 When presented with a choice, there are objective aspects as well as subjective attributes that are assigned to it – mostly without even knowing that you are doing it. Subjective influences are given to the choice presented. How is this choice affected by your goals, your values, and even your past experience? In fact, I challenge you to exploring your biases and inner world – how does it makes the process of decision making not just an objective conscious one, but a harder subconscious endeavor? Beware of your biases when making decisions. Have you noticed that the choice coming from a certain person or business entity is loaded with predictions you already have about the values and consistency of behaviors of this entity? In such a case you already are making predictions about the direction of this choice. When you assume that people or organizations behave a certain way because of their past attributes, and that those attributes are a good prediction of future behavior, you are blinded by the situational factors, which can lead you to a big surprise. FAE, Fundamental Attribution Errors is the phenomenon social psychologists call referring to this bias. The way to tackle this bias, is to pay attention not only to the objective aspect of the choice presented, but also to the situational context of the choices. Namely, the barriers in the situation that influence behavior and decisions that cannot be predicted by past history or attributes of the entity or the choice. Another bias people intuitively respond to is language. In presenting people with decision making dilemmas, paying attention to the language used to frame the choices affects the decision. Why? Because the way the choice is framed affects the meaning that someone will attach to it and the associations and mental pictures tied to this choice. Are you pro choice or pro life? Do you have a secretary of war or a secretary of defense? Are you for enhanced interrogation or torture? Can you imagine the influx of images, attributions and feelings that come when a label is used? It is an automatic process that determines what action you will take. An action that represents how you think of your priorities and your values. Research shows that people will attach themselves to a meaning that is salient to them, a choice that represents who they are. Language helps them sort through the decision to make that meaning. Does making a decision now seem like an exhaustive process? Not really. The key to its simplicity is awareness. Being aware of biases, the effects of minor manipulations in language, context and framing, will lead to big changes in decision making. The mere awareness provides more wisdom and control over decisions – so next time you decide if you are pro this or pro that! Remember the packaging of the decision, inspect your context, watch out for the meaning you are attaching to it, and you will be able to make the decision that best reflects your values, goals and intentions. Happy decision making! Gigernzer, G. Gut feelings, the intelligence of the Unconscious. 2007. Penguin group: New york, NY. Gilovich, T and Ross, L. 2015. The Wisest one in the room: How you can benefit from social psychology’s most powerful insights. Free Press: New York, NY.